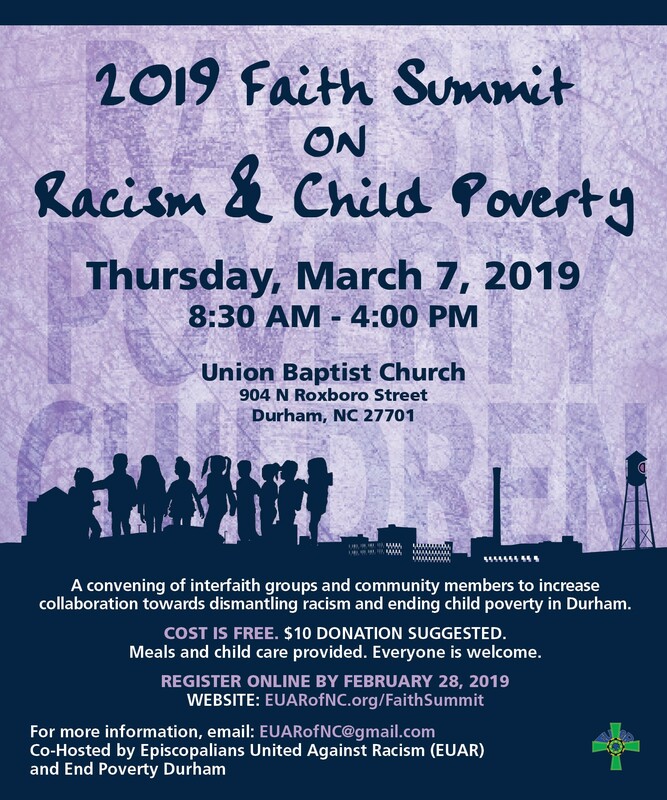 Please join The Partnership along with so many others who care about Durham for the 2019 Faith Summit on Racism & Child Poverty on Thursday, March 7th, 2019 from 8:30 am – 4:00 pm at Union Baptist Church, 904 N Roxboro Street Durham, NC. The 2019 Faith Summit is co-hosted by Episcopalians United Against Racism (EUAR) and End Poverty Durham. This all-day, interfaith event will include local and national speakers, agencies, and community organizers working in the field, breakout sessions, collaborative planning, and future engagement opportunities. 1. Participants will gain awareness and understanding of racism as the root cause of child poverty. 2. Participants will discover resources and services already happening in Durham to reduce racism and child poverty. 3. Participants will create collaborative steps for congregations and organizations to work together to reduce racism and child poverty in Durham. Structural racism is considered to be a “system in which public policies, institutional practices, cultural representations, and other norms work in various, often-reinforcing ways to perpetuate racial group inequity.” Quantifying and identifying such a large problem with multiple components including historical and cultural reasons can be challenging but is a necessary step to end and ameliorate inequity.